Selecting the right axe for the job is important. The differences in the blade, head weight and length of the handle can make a job a lot easier. With the different types of axes available selecting the right one can be hard. 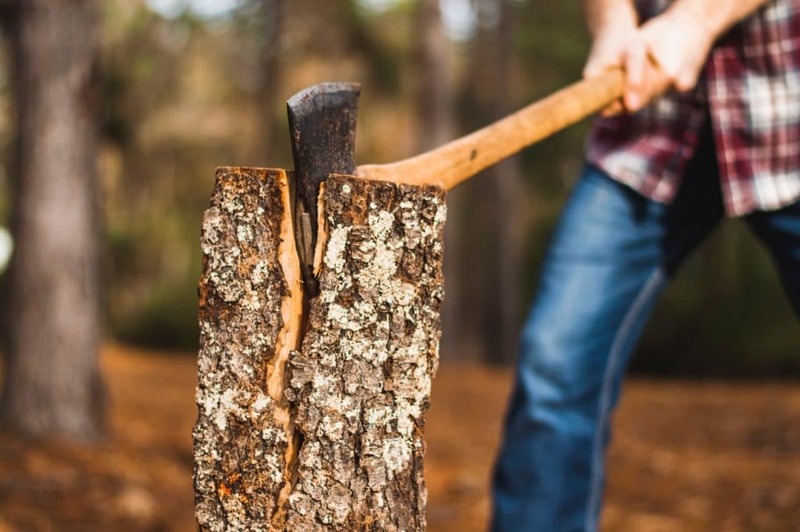 If you are new to splitting wood or chopping down a tree you might be tempted to buy the first axe you can find in the store. In this article, I will tell you about the different types of axes there are and what the main purpose is for them, so you can get the right tool for the job. The hatchet is one of the most common axes on the market. Most people have one laying around. A hatchet is a small axe that you can hold with one hand. The hatchet is an ideal axe for small chores around the house, such as chopping kindlings or removing branches. You can buy a hatchet for a few dollars. But I recommend spend a few bucks more to buy a good hatchet. You will see that it’s one the most used tools in the garden so make sure it has a good handle with a fine and straight grain. The edge should be sharp and the hatchet should have a nice balance. If you are interested in buying a hatchet, make sure you read this article to find a good one for under the $ 50. My personal favourite is the Fiskars X11, it is the most bought Hatchet on Amazon and for a good reason. Another commonly bought axe is the splitting maul. The splitting maul is known for it’s big and wide head which make it ideal to split wood. The poll of the axe is big and flat, ideal when you need to thrive in a wedge. Splittings axes (or mauls) have a pretty long handle which will help you to split the wood. If you are going to buy a splitting maul, then keep in mind a longer handle is harder to control, but give you more force. So if you are in-experienced in splitting wood, start with a short handle first. Again a Fiskars, the X27, is the most popular splitting maul on the market. You can get one on Amazon around the $ 55. If you don’t like the fibre handle, then go for a Husqvarna. A felling axe is made for felling down trees. If you compare the head of a felling axe and a splitting axe you will see that the head of a felling axe is tapered with a long rond blade. The edge of a felling axe is kept razor sharp so it can cut through the wood grain. With a felling axe is it even more important to select a proper handle length. To cut down a tree efficiently with a felling axe you will need to have good control over your axe. Otherwise, you won’t hit the same place twice. I have written a buy guide for buying a felling axe. Make sure you read it before you buy one. A double bit axe is just a two for one axe. It’s a felling axe and splitting axe combined basically. One side of the head is sharp and has a tapered shape, ideal for felling down a tree or to cut wood. The other side of the head is blunt and wider so you can use it to split wood. You would say this is the ideal axe to take out on a trip, but keep in mind the head is really heavy. So you will be tired half way the job felling down a tree. The positive side of the weight is that it makes splitting the wood a lot easier. But again, you will have to carry that weight as well. Double bit axes are not really popular anymore. It doesn’t mean you can’t buy them anymore though. The premium brands still have them in their collection, but they are a bit expensive. More affordable are the double bit axes from Truper. You can get one for less than $ 50 on Amazon. A Hunter’s axe sits right between a hatchet and carpenters or outdoor axe. With a handle length around the 16 is it perfect for those who find a hatchet just too small. A hunters axe is commonly used for building small fires and creating a shelter. Due to its size, you can easily carry them, yet they are still big enough to chop, split cut small logs. Not many brands have hunters axe in their collection. You will find them mostly in the Swedish brands, like this Hults bruk on Amazon. A carpenters axe is one of the most used axes in the outdoors. They are also known as an outdoor axe. The handle of the axe is slightly longer than that from a hatchet, allowing you to hold it with one or two hands. Due to it’s length and a bit heavier head is it ideal for chopping down small trees and do other small chores around the camp. A typical outdoor axe has a handle length around the 20 in and a head around the 1.8 lb. 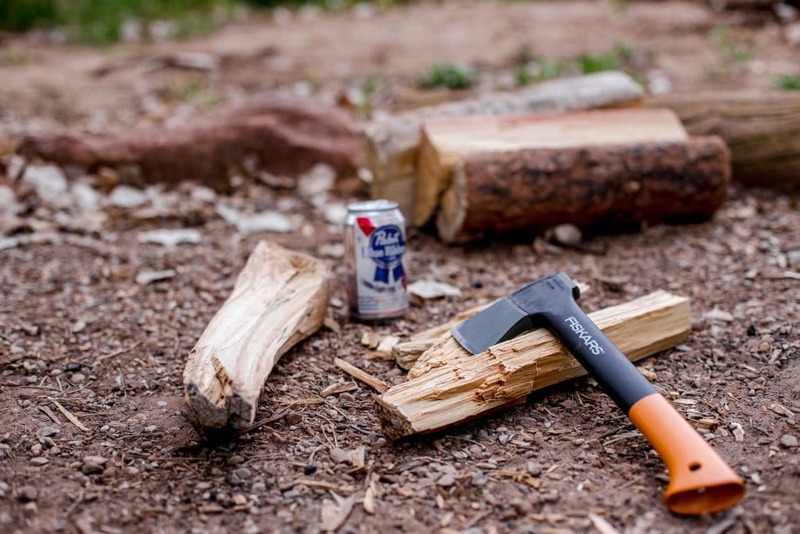 Husqvarna makes good and affordable outdoor axes, but if you want to buy a quality axe then you really should look into the Gransfors Bruks Small Forest Axe. This is a premium axe made in one of the oldest forges in the world. The Tomahawk axe design it pretty old. They were used by the Native Americans and can be described as a light hatchet. 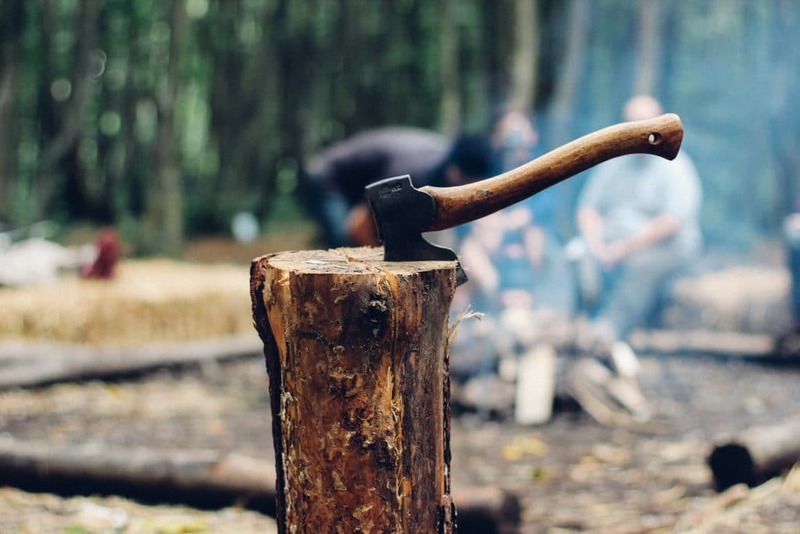 You might see the Tomahawk axe on campsites, but they are not ideal to use for gathering small firewood. Because they are lighter then a hatchet, you will need more swings to get the same result. What they are used for is for throwing. Throwing Tomahawks is a popular sport in America. 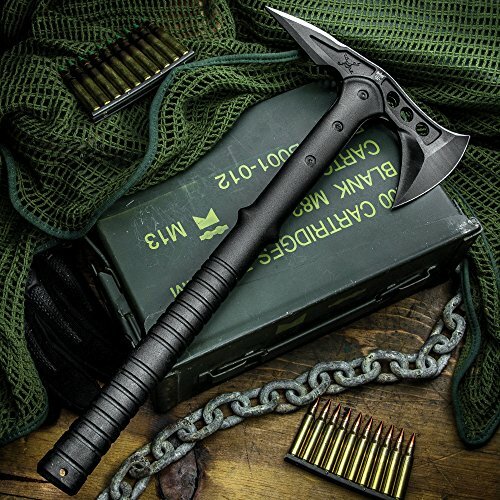 The M48 Tomahawks are one of the most popular Tomahawk axes on the market. If you are into throwing an axe, then you really need to look into this axe. A Viking axe is a completely different type of axe. It’s not used for chopping down trees of splitting wood. No, Viking axes are old battle axes used by the Vikings. Now you might think why are they included in the list, but as it turns out, Viking axe is still pretty popular. Partly for the battle re-enactments but also as “collectors” items. They look really cool a with prices around the $ 40 they are really cheap. 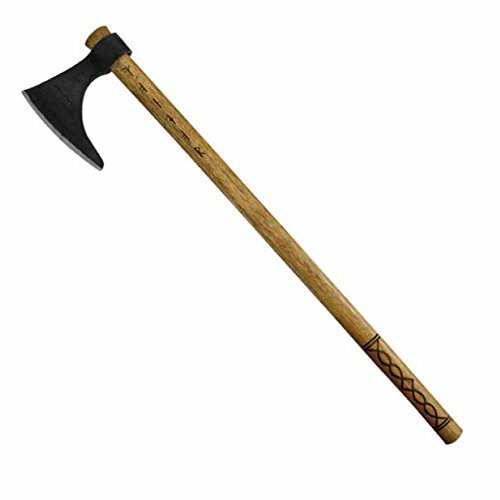 A typical Vikings axe has a handle length around the 6 in, a burned hickory handle and a long beard. Battle axes are just like the Viking axe solely used for battle re-enactments. A battle axe is much small then a Viking axe, it’s made to be held in one hand and a really powerful weapon. You won’t find a battle axe at home depot for example, but only you can easily buy one for a couple of dollars. The last axe in the line is the tactical axe. Now tactical axes are not used for combat, but more as a multi purpose / survival tool. They are generally made of steel and are small (10 in handle) and light. Due to its size, you can easily pack them or carry them with you on a hiking trip. You won’t be able to cut down a tree of split wood with it, but chopping some small branches will do just fine.